It’s holidaying season and a good time to venture beyond Sydney. A trip to the Blue Mountains is always a great idea, and the National Trust property, Woodford Academy, is even more reason to explore one of our most picturesque regions. I spoke with Mitch on 2SER Breakfast about its development, from an historic inn to a school for boys. Archivist and writer, Ken Goodlet, has recently published an article in the Dictionary of Sydney on this historic property which contains the oldest collection of buildings in the Blue Mountains. Back in the 1830s Woodford in the Blue Mountains was known as 20 Mile Hollow. Before Woodford Academy became the grand set of buildings it is today, in 1831, the only building on the site was a sly-grog shop established by the convict and illegal squatter, William James, and his wife Mary. Also in that year the former convict, Thomas Pembroke, was awarded two acres of land and he constructed an inn called ‘The Woodman’. Until the mid-1840s The Woodman was a day’s travel from the nearest inns at Valley Heights and Wentworth Falls. Today these sorts of distances are made in 20 minutes by car, but back in the 19th century, these roadside inns were a welcome sight for the weary traveller undertaking the long, arduous trek across unsealed roads. But the life of the publicans who managed these inns was an isolated one; Goodlet notes that William James’ wife Mary committed suicide within five years of establishing their business. And it seems there were also dark times for Thomas Pembroke and his wife Frances. After Thomas was gaoled in 1837 for theft, Frances appealed to the governor for his release as she was an ‘unfortunate and destitute wife’ with nine children, and in desperation she reportedly turned to prostitution. Thomas was later admitted to a mental asylum and Frances remarried. 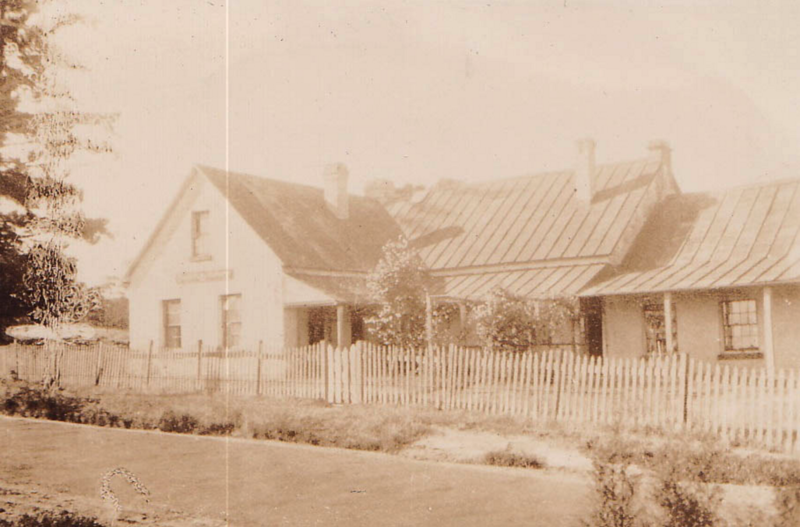 The prosperity of the inn continued and the discovery of gold in the Bathurst district in 1851 brought thousands of people from all over along the Western Road from Sydney to Bathurst. During this time, the inn tripled in size and today, the low, quaint rooms built at that time have survived and are little changed. One of the inn’s most famous owners was William Buss, a former convict who would welcome guests at the front door wearing a distinctive scarlet waistcoat. Unfortunately the days of the roadside inn began to dwindle and in 1868, the Sydney merchant Alfred Fairfax purchased the property for £450 as a country retreat, renaming it Woodford House. Fairfax’s purchase of the property as a retreat from the city formed part of a shift in general perceptions of the Blue Mountains. No longer a wild, threatening landscape, the mountains were now valued for their fresh, healthy mountain air, their waterfalls and sweeping views. Woodford House ran as guesthouse until 1907, when it was leased by the distinguished scholar, John McManamey, and turned into the Woodford Academy for Boys. In its first year, the school had 28 pupils with 15 of them boarders. Each morning at 7am the boarders would emerge from their dormitories and run 1.5 kilometres north to Mabel Falls where they would swim before running back! They were taught the usual subjects like English, History, Mathematics and so on, but also Latin, bookkeeping, music, dancing and sometimes, Greek. And, McManamey encouraged students to engrave their initials on the desks and window frames, believing they would ‘make their mark’ in history. 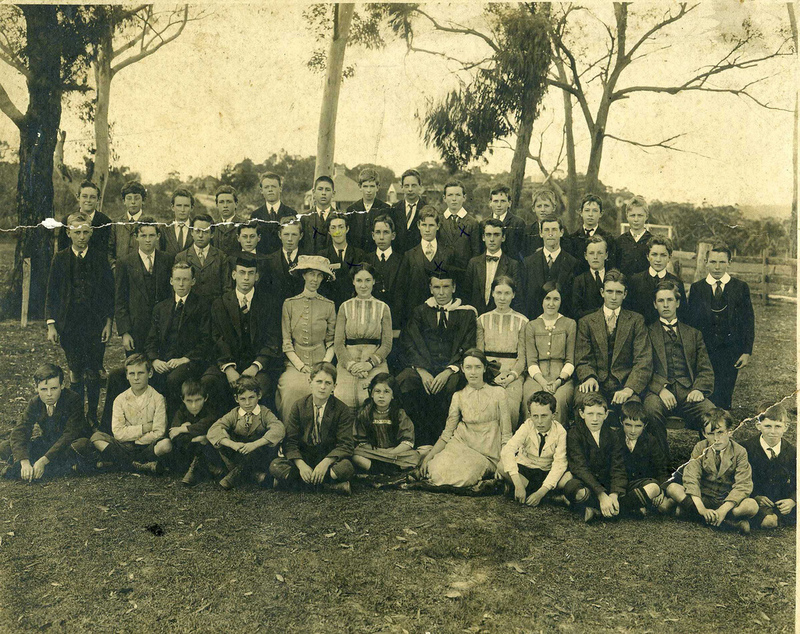 The school closed in 1925, and McManamey’s daughters continued to reside there taking on boarders. In 1979 the last surviving daughter, Gertrude, bequeathed the property to the National Trust. It operates as a museum today, documenting the property’s iterations and telling the stories of its many colourful residents. Check out the National Trust’s website for details about the museum’s opening hours. Listen to my segment at 2SER radio and read the original article by Ken Goodlet at the Dictionary of Sydney. For other interesting segments, see my Dictionary of Sydney project post and visit the Dictionary of Sydney blog.